We’ve loved these Talk Boards and Talk Blocks since we first laid eyes on them for the myriad possibilities they offer to fully customize a lesson or activity for each student. They’re designed to fit perfectly with the Basic Vocabulary, Alphabet, Kindergarten, and First Grade Vocabulary Photo Card Sets. 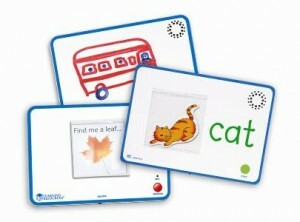 The Talk Boards are double-sided with write-on/wipe-off surfaces and come in a set of 3. You can record a 10-second message for each one enabling you to get creative in endless, fun ways! 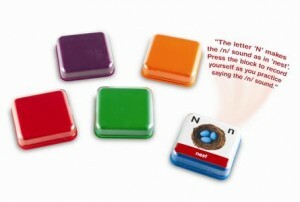 The Talk Blocks come in a set of 5, each a unique color, and you can record 30-seconds for each one to adapt activity instructions, assess or reinforce skills. This week only, save 15% on all Talk Boards and Blocks as well as the 4 sets of Vocabulary Cards – Alphabet, Basic, Kindergarten and First Grade – by entering the Promo Code BLOGTBT2 at checkout. *Offer expires on February 28, 2012 at 11:59 pm EST. Not compatible with any other offer. Be sure there are no spaces after the Promo Code when you enter it at checkout. Written by: Different Roads to Learning on February 21, 2012. This entry was posted in ABA, Difflearn Promo Code, Pick of the Week, Sale, Speech & Language and tagged ABA, Applied Behavior Analysis, autism, autism education, conversational skills, Different Roads to Learning, generalization of skills, language development, learning, Resources, teaching, teaching tools, visual cues, visual supports by Different Roads to Learning. Bookmark the permalink.